When I went to Scotland in September 2009 to visit Don Denis on the Isle of Gigha, it was the most rewarding trip of my lifetime. Don Dennis is the creator of Living Tree Orchid Essences at www.healingorchids.com. Like many people, Don did not quite recognize his own talents. He spent 1 1 1/2 to 2 hours every day tending to his orchids, making healing remedies from them and photographing them. He knew that the essences he made from the orchids were quite powerful because healers from around the world would come to Scotland to study them. But little did he truly understand just how uplifting his photographs of his orchids actually are. He was just taking pictures to illustrate his work and accompany the text explaining the benefits of each one. I convinced Don to make greeting cards from his photographs. More people would be attracted to his work, I argued, if he made the cards and people sent them out around the world. Because I like to support my friends, I was one of his first customers for his cards when they finally came out and bought multiple boxes of his cards both to give to and send to my friends. I also immediately framed seven of these cards and put them on the wall opposite to my bed so that I could wake up and go to sleep meditating on the orchids. While I was in Scotland, my guidance told me to get another one of his photographs enlarged, frame it and mount it on the wall above my bed. But like many other people, I did not listen to my guidance. In fact, I fought it. I kept arguing with myself. The photograph would have to be sent from Scotland rolled up in a tube. More than likely, I thought, it would arrive wrinkled by the time it made it to Atlanta. Then there was the expense of the shipping all the way from Scotland and the added expense of putting the beautiful photograph in a suitable frame, as not just any frame would do for a photograph that magnificent. The orchid in the photograph is Laeliocattleya Angel Love. It makes an essence called Angelic Canopy. Don says that if you can have only one of his Living Tree Orchid Essences, this would be the one to have. It makes you feel lifted up and protected by the angels. I reasoned with myself that my yearning for this picture would eventually pass. I kept thinking about Don’s photograph. I could not get it out of my mind. Some months after I originally wanted it, I went through a particularly challenging time in my life. “So that’s why I needed that picture,” I thought to myself. I kept reasoning that when the difficult time would eventually pass, I wouldn’t need that picture any more. Every time I looked at the existing picture that was already framed above my bed, all I could think about was how much better I would feel if I had Laeliocattleya Angel Love in its place. Finally, two and a half years later, I was still yearning for this picture. By now, Don had a new photograph of a new blossom. He gave me a choice, and I picked the newest one. The newest photograph – to me – is even more stunning, even more uplifting, even more exciting than the one I originally craved. Finally, I ordered my picture. It did indeed arrive wrinkled in the tube from Scotland. The frame was indeed ridiculously expensive, even though I used a 50 percent off coupon from Michael’s to get the job done. But when the photograph was finally mounted on the wall above my bed, I looked at it, and my entire mind-body-spirit just melted. At last, it was at home! “How many orchids do I need, exactly?” I wondered to myself. I have live cultivars in my studio, so that I can look at them every day while doing my healing work. The energy there is so good they bloom continuously and repeatedly, often for years on end. No matter how difficult the client’s problems may seem to be, all I have to do is look at my orchids and I know there is a way to heal them. Orchids are the most evolved flowers on the face of the planet. They selflessly uplift us. Rare. Quiet. Stunningly beautiful. To my mind, they make the most powerful of all the flower essences. I use Don’s remedies every day for myself and virtually every day with my clients. 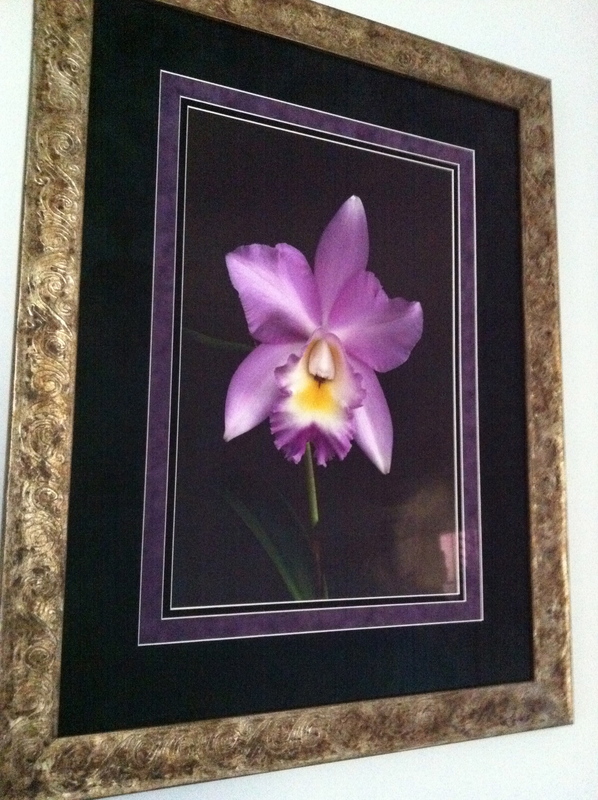 Photograph: My final framed picture Laeliocattleya Angel Love.